Frank Sinatra was making a name for himself with the Tommy Dorsey band. The teenage girls of the day, also known as bobby soxers, were his biggest fans. With World War II underway, Sinatra was classified as 4F for a perforated eardrum. He did support the war effort through USO tours. In 1943, he signed with Columbia studios as a solo artist. 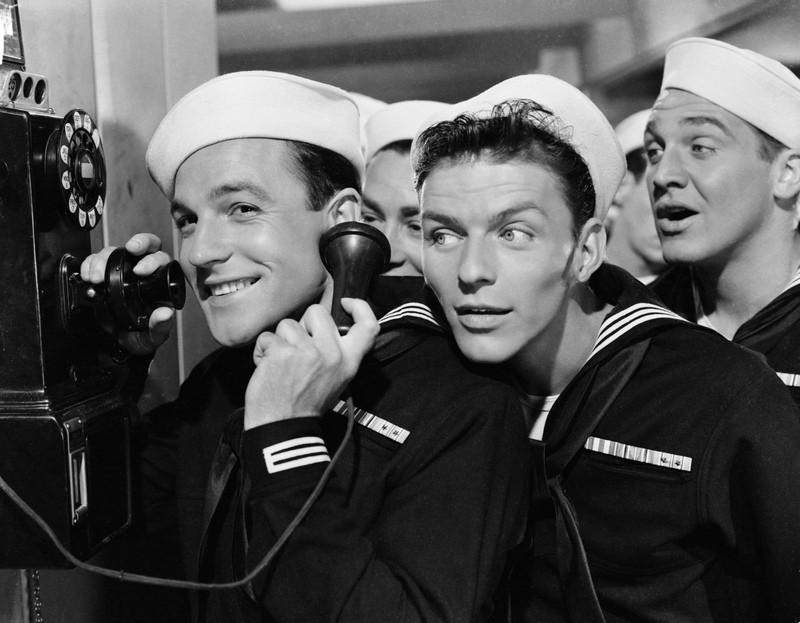 After several small film appearances, he had his largest role to date co-staring with Gene Kelly in the 1945 musical, Anchors Away. The next year he released his first album, The Voice of Frank Sinatra. He also debuted a weekly radio series. In 1949 he reteamed with Gene Kelly in Take Me Out to the Ballgame and On the Town. In 1951 his radio show moved to TV, but he did not find the success he’d hoped for on TV. This is the same year he divorced his wife, Nancy, and married actress, Ava Gardner. 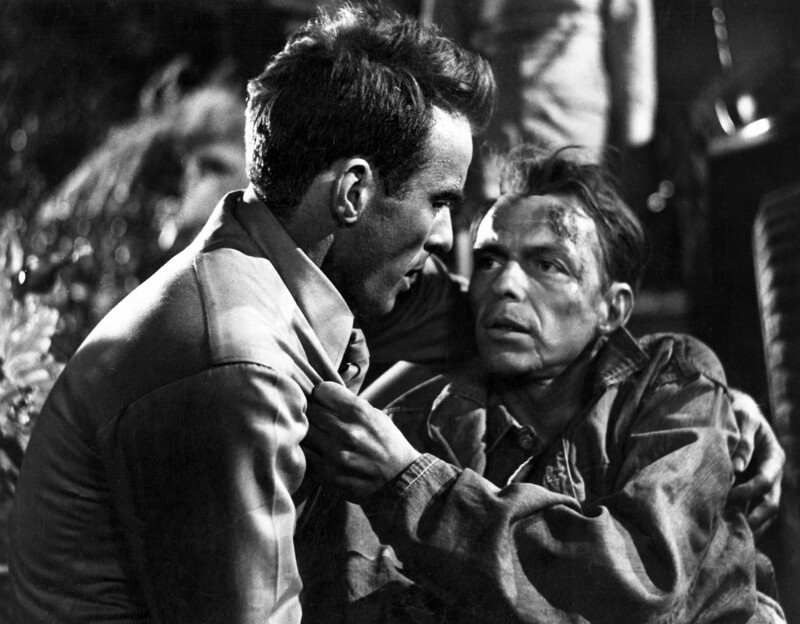 His career began to stall until 1953 when he won an Academy Award for Best Supporting Actor in From Here to Eternity. He also signed with Capitol Records and began a successful partnership, introducing many of his “swinging” songs such as Come Fly with Me. In 1955 he stared in Guys and Dolls. The following year he stared alongside Bing Crosby and Grace Kelly in High Society. A variety of other movies followed throughout the years. In 1957, after almost six years of marriage, the tumultuous relationship with Ava Gardner ended. Sinatra worked with a group of entertainers in Las Vegas casino shows and the men became good friends. These men included Dean Martin, Peter Lawford, Joey Bishop, and Sammy Davis, Jr. They would eventually become known as the Rat Pat. In 1960, after wrapping on the Can Can, Sinatra and the Rat Pat filmed Oceans 11. More films together would follow including Robin and the 7 Hoods and Sergeants 3. In 1962 he stared with Janet Leigh in The Manchurian Candidate. In 1963, while filming Robin and the 7 Hoods with Bing Crosby and the Rat Pat, Sinatra faced several crisis. First was a falling out with Peter Lawford that led to the two men never speaking again. Secondly, was the loss of his good friend, President John F. Kennedy, when he was assassinated on November 22, 1963. Then in early December, his son, Frank Sinatra Jr., was kidnapped. Thankfully he was released two days later after the ransom was paid. However, all of this was very stressful and took a toll on Frank Sinatra. For a while, he even considered shutting the film down, but the film was completed and released. movie appearances over the years. He chose to focus on his casino act and live concerts. The same year, his short two-year marriage to Mia Farrow ended. In 1969, he released his biggest hit song, My Way. Throughout his career to this point he was a lifelong supporter of the Democratic Party. However, this would change in the early 1970s. His movie career featured a variety of roles. He appeared in numerous musicals, comedies, action and dramatic roles and films throughout his varied career. The remainder of his career would be a series of retirements and come backs. In this first clip, enjoy as Frank Sinatra shares some of his favorite film experiences.